Mid-Term Plan | Tokai Carbon Co., Ltd.
(3) Organizational rigidity and overconfidence in our technology We feel that the three years of the previous plan have given us a great deal to think about. We have learned valuable lessons from T-2015. In the new Mid-Term Management Plan T-2018, we will be implementing comprehensive structural reform based on business restructuring and changing the company’s mindset to rebuild the foundation of our business in a return to our first principles. T-2018 sets management policies for the three-year period from 2016 to 2018. This three-year period is divided into two phases. 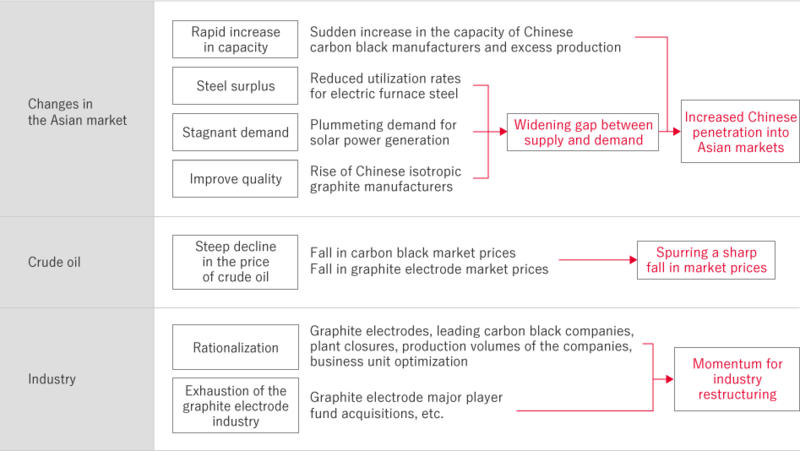 In Phase 1 in 2016, the first year of the plan, Tokai Carbon implemented structural reforms. In Phase 2, running from 2017 to 2018, the company went forward with its growth strategy. 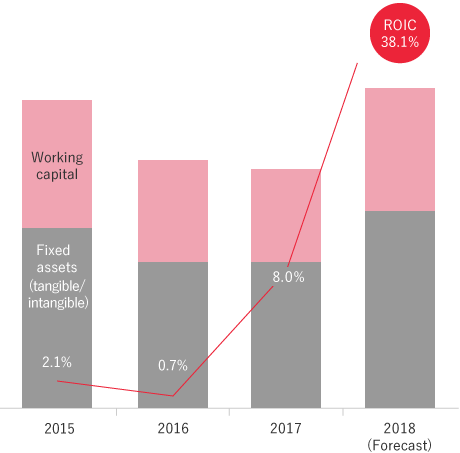 We have set a target of Sales \110.0 billion, Operating income \9.0 billion, ROS 8%, ROIC 6% in 2018, the final year of the Mid-Term Management Plan. Today, we achieved most of these targets already in 2017 year end. We anticipate 2018 results to be at much higher level. 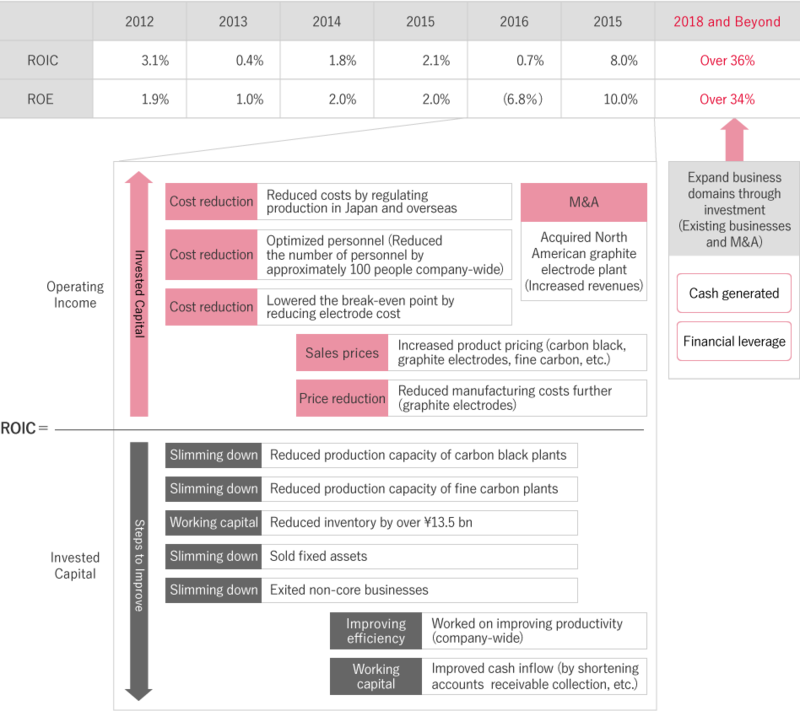 Both net sales and operating income are projected to substantially exceed the targets. Sell idle assets of Tokai Konetsu Kogyo Co., Ltd.
During the first year, FY2016 (Phase 1), Tokai Carbon engaged with all the issues assumed by the plan and almost all the plan goals were achieved. The size of the issues that had built up within the company over the years was even greater than had been anticipated. The company is currently booking over ¥10.0 billion in impairment losses for the period and in the end was left with no choice but to post record-setting losses. Nevertheless, the plan has resulted in an improvement in the company’s business condition and we were able to streamline the organization to make it profitable. i. Optimization of carbon black manufacturing plants Close one line at Tokai Carbon (Tianjin) Co., Ltd. Transferred idle assets from Tokai Konetsu Kogyo Co., Ltd.
Sold Nagoya Green Club assets, etc. Tokai Carbon has implemented a range of strategies to change the mindset internally. We believe the reforms that we have implemented in the decision-making process for business decisions, the human resources exchanges fostered between business segments, and the use of outside human resources have been even more effective than anticipated. We are planning to continue these initiatives. Reforming the mindset internally and further improvements to our technical capabilities involve matters of corporate culture. This is not something that can be done overnight. We will continue our strong engagement with these important issues throughout the remainder of T-2018. In 2016, we focus our efforts on structural reform to build a firm foundation for growth. In 2017 and beyond, we will deploy strategies for growth based on a new foundation consisting of the business restructuring completed in Phase 1 and ongoing efforts to change the mindset internally. Each of the business segments is deploying policies according to their respective potential markets to (1) improve profitability and (2) expand business domains toward the development of policies for our growth strategy. The third approach, (3) mergers and acquisitions, will give due consideration to peripheral business domains regardless of Tokai Carbon’s existing business domains. We will optimize our business portfolio and enlarge the company scale in view of the mid- and long-term. In the process of the structural forms of T-2018, we had no choice but to slim down our business. In the last phase of T-2018, however, we will be sowing the seeds of a growth strategy. Our efforts will be to ensure steady growth after T-2018. We aim to increase the scale of our business over the mid- to long-term, and toward that end we have set a strategic investment budget of ¥50 billion. This strategic budget allow us the Acquisition of shares in SGL GE Carbon Holding LLC (November 2017) and Tokai Carbon Korea Co., Ltd.(May 2018) that now joined Tokai Carbon Group. Further on, we are now in a process to close the deal of acquiring Sid Ricahrdson Carbon , Ltd (completion of acquisition expected September 2018). The series of these business decision are to stabilize our business portfolio and to expand our business domains. our core business and through financial leverage.